I entered Bernina's We All Sew Challenge (upcycling), and it's time to vote for your favorite project! 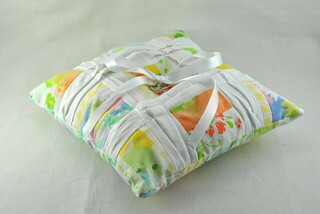 You can check out my Vintage Sheets Ring Pillow here and then vote for your favorites. If you are having trouble with the link, just go to Bernina's Facebook page and then click the We All Sew button to see the projects and vote. You may need to install the app if it's your first time, but it's quick and easy. Thanks friends! I promise I will be back soon with a Quilt Market update, and some other odds and ends. I voted for you! I love my Bernina and how cool that you're in this challenge! Good luck!